(Jan. 10, 2014) On New Year’s Day, 1,024 passengers boarded the Winterfest Express for a ride through the illuminated Northside Park, wrapping up the 42-night holiday spectacular. 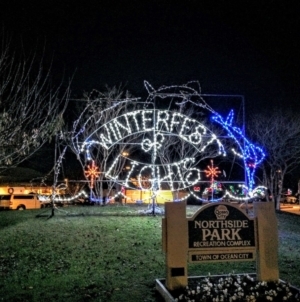 The 127th Street Winterfest of Lights displays, which contained as many as 1 million lights and more than 100 twinkling, shining, glittering and animated scenes, were viewed by 91,748 people, according to Tom Shuster, director of the Ocean City Recreation and Parks Department. An average of 2,185 people rode the train through the park each night. The overall total was a bit less from the 95,599 passengers who took the 12-minute train ride last year when Winterfest of Lights was in operation six additional days (48). The average daily ridership for the 2012-13 festival was 1,992. “Winterfest of Lights went very well this year,” Shuster said. Attendance during the final weekend of the 21st annual event was solid, with 4,004 riders on Friday, Dec. 27, 5,942 on Saturday, Dec. 28, 991 on Sunday, Dec. 29 (rain), 3,336 on Monday, Dec. 30, 3,398 on New Year’s Eve and 1,024 passengers on the last night, Wednesday, Jan. 1. The biggest night overall was Saturday, Dec. 21, when 7,954 people rode the train. The second largest attendance night was Saturday, Nov. 30, when 7,232 enjoyed the festivities. The fairly mild, consistent temperatures was a factor in the overall attendance, Shuster said. Rain only hampered attendance a few nights. Winterfest of Lights has become a tradition for families. Many visit each year to take the guided open-air tour through the park accompanied by holiday music. Some existing displays were refurbished and upgraded this year, and many of the lights were replaced with LED (Light Emitting Diodes) bulbs, which are energy efficient, have greater brilliance, are more vibrant and last longer than other lights. A new light displays was added as well–the Coca Cola polar bears. For the second year, there was a fireworks display at midnight on New Year’s Eve. 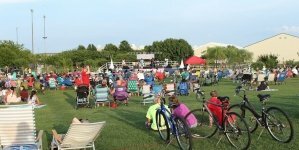 It was well attended last year, but Shuster said it looked like twice as many people headed to the park and surrounding area to watch the 10-minute show, presented by American Fireworks of Hudson, Ohio. He estimated a couple thousand spectators viewed the show. Crews began unpacking displays from trailers and setting up the winter wonderland in early October. An opening ceremony on Nov. 21 included Ocean City Elementary School’s “OC Stars” singing and dancing, comments from Mayor Rick Meehan, an appearance by Santa and the ceremonial “flipping” of the switch to illuminate the park. “Opening night was one of the best weather-wise,” Shuster said as the temperature was in the mid-50s. There is a different layout for the Winterfest of Lights displays each year in order to keep it new and fresh for riders. 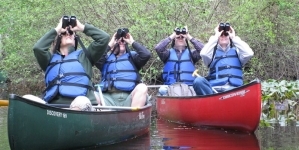 It also challenges them to find their favorite display in a new location. Some of the displays featured at Northside Park included the 12 Days of Christmas, Santa, his sleigh and eight flying reindeer, fairy tale characters, toy soldiers, crabs, marlins, “Jaws,” a penguin village and dinosaurs. The heated tent at Winterfest kept visitors warm as they listened to music and waited for the Boardwalk trams to take them through the enchanted park of lights. The tent was home to the Winterfest Village and Yukon Cornelius’ Gift Shop filled with ornaments, stocking stuffers, souvenirs and holiday gifts. Visitors also had the opportunity to have their photo taken with Santa and grab a warm beverage or snack. 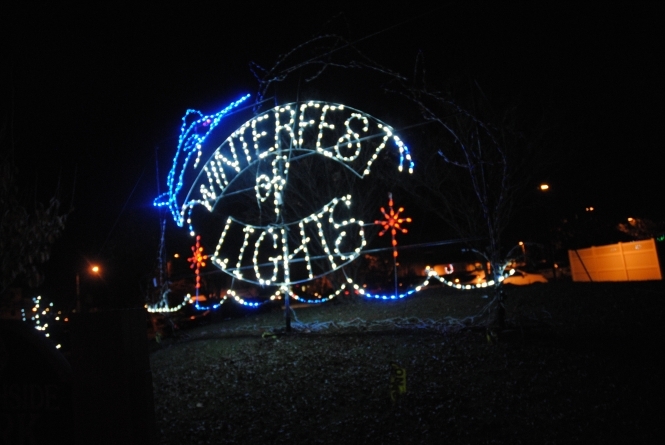 Winterfest of Lights has received many accolades over the years. 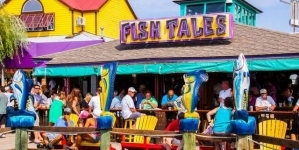 The Ocean City attraction was ranked No. 1 in 2008 on the Professional Travel Guide Editor’s Top 10 of the nation’s largest and best holiday lights displays. 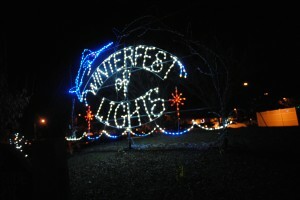 In 2006, Winterfest of Lights was No. 2 in the country in the “America Online City Guide’s Top 11 Lighting Displays.” The Disney-MGM Studios display in Orlando topped the list.